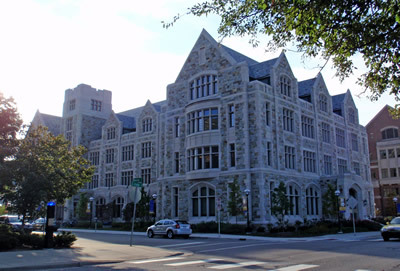 The project includes a new academic building located south of Monroe Street, an addition between Hutchins Hall and the William W. Cook Legal Research Library for a new Law School commons, and renovations within both Hutchins Hall and the Cook Library. The new academic building will be approximately 100,000 gross square feet that will house classrooms, multi-purpose spaces, clinic work spaces, and offices for Law School faculty and administrators. The Law School commons project of approximately 16,000 gross square feet will provide needed student study, interaction, and support spaces. Additionally, the project will include life safety upgrades to Hutchins Hall and the Cook Library and the addition of an electrical substation and chilled water plant. The project will also replace the metal siding on the connection between the Law Quad buildings and the Cook Library stacks wing with a masonry façade.